Our picks for Hong Kong’s best restaurants with a view! Restaurants with soaring vistas of the city might be known to break the wallet but when you save it for the right occasion, the splurge (we’re looking at you, brunches that cost $1,998 per head) can be worth it. These seven restaurants pack a mighty punch: whether you’re off to show Hong Kong’s best to visitors or sharing that date night with that special someone, we’ve got you covered! Be sure to snap a table ahead with Chope, and earn yourself 2X Chope-Dollars with the promo code TASTYBLOG. Perched on the thirty-eighth floor of Hotel Panorama by Rhombus, AVA Restaurant Slash Bar flaunts spectacular views of Victoria Harbour and beyond. With the aim of providing top quality international cuisine to their diners, they serve up dishes such as Milanese style risotto with bone marrows, saffron, and Parmigiano, as well as our favourite Homemade Tagliolini with Sea Urchin Sauce. Their Sicilian Red Prawns Marinated in Herbs, New Zealand Lamb Shank, and French Spring Chicken would be our top picks at AVA. Another crowd-pleaser is their signature nitrogen liquid ice cream made tableside with raspberries & rose water to complement those stunning 270 degree panoramas. This authentic Italian mainstay may not be located on the highest floor of its building, but trust us, the views are still Insta-worthy. Sitting on the second floor of Grand Hyatt in Wan Chai, you get the best of HK skyscrapers, sights from Kowloon, and the magnificent sweeping waters that HK takes pride in. Grissini lives up to its name as the air is filled with the irresistible smell of Italian breadsticks (‘grissini’ in Italian). Their interior is chic and as divine as their Italian fare; think succulent Roasted Wild Grouper and Homemade Potato Gnocchi with Mediterranean seafood and zucchini. Finish off with their Lemon Dome Cake served with vanilla sponge and lemon cream. It’s the ideal hot spot for a ravishing night. Head over to the thirty-first floor of Regal Hotel in Causeway Bay and step into a posh interior and dining environment with plush velvet chairs and delicate enchanting chandeliers. Our luscious and flavourful favourites would be Grilled Lamb Chop served with creamy Black Truffle Sauce and Sauteed Italian Mussel with Cherry Tomato and Vernaccia Wine. Looking to impress? Opt for their Italian Business Semi-buffet Lunch, which includes a highlight of an antipasti buffet with Fennel Salad, Mozzarella Roll Filled with Tomato and Pesto, and more! Too busy during the week? They have a Sunday Oyster and Bubble Brunch as well, which is a fantastic way to end a stress-filled week and revitalise yourself with the cityscape. 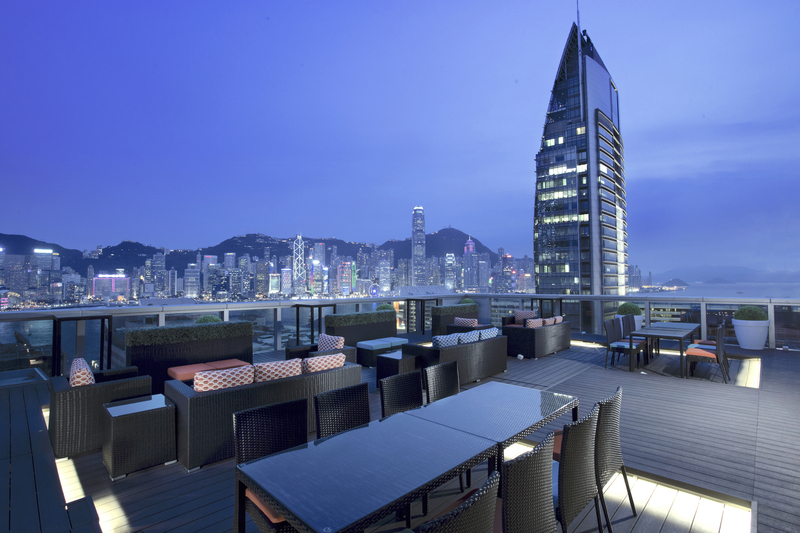 Qi – Nine Dragons is nestled atop of the towering Prince Tower in Tsim Sha Tsui where diners are spoilt by sunset views of Hong Kong Island. Step in for a splendid dining experience at the city’s only Michelin-starred Sichuan restaurant with their fiery flavours that include their famous Bang Bang Chicken in Spicy Peanut Sauce, Wok Fried Prawns with Sichuan Chilli Miso, and (for something less spicy) their Flaky Scallion Pancake which is for sure, a top pick! Don’t miss the delish Chilli Dungeness Crab, a delicacy that has to be reserved in advance to ensure that diners enjoy the freshest seafood. Kick back and savour in the fantastic panorama while imbibing their special chilli-infused tequila cocktail, Red Dragon, under the stars on their expansive 1,600 sq ft. rooftop terrace. As the name suggests, this TST mainstay at Hotel Icon is indeed ‘above and beyond’ in terms of location and dining experience! To start, savour on the Smoked Egg with Oolong Tea Leaves and Black Truffles, followed by their Steamed Garoupa Fillet with Egg White in Superior Chicken Broth: the chicken is soaked in a hot broth with freshly caught Garoupa and is simmered for 12 hours. Our fan fave, though, has to be the Claypot Rice with Chinese Preserved Duck and Sausages (think poached duck pieces on top of piping-hot rice, giving the meat a firm-yet-tender texture). Above & Beyond truly spoils us when it comes to dishing out beautiful views and delectable dishes. Rooftops usually have priceless views, and Uptop Bistro and Bar has exactly that in store for you. Located in Popway Hotel’s Sky Deck, prepare to be ensconced with 270 degree views and top modern fusion comfort food. Whether it’s the Canada Organic Pork Loin, Uptop Signature Chicken with carrots on the side, or if you’re looking for something lighter: the delicate, just caught Pacific Black Cod – there’s certainly something for everyone. Fan of tea? Indulge in their Afternoon Tea Menu that offers diners two options starting at just $388 for two! While you’re up there, knock down a few cocktails like their Full Moon made with Gin, Yuzu Juice, and Jasmine Syrup, or some Dessert Wine Exquisite vistas of Victoria Harbour from Uptop are guaranteed. Pinky promise. Your everyday pocket-sized culinarian and Lucky Peach-head with a penchant for bizarre foods.